Goblin’s Cave Multispin Video Slot Guide & Review - Casino Answers! Goblin’s Cave is a 3-reel, 3-row multispin video slot developed by Playtech, featuring a wild symbol, a hold feature and a bonus game. You can play Goblins Cave at Titan Casino and Bet365 Casino. After the initial spin and you have chosen which (if any) of the reels that you wish to hold, you must hit “Spin” a second time. This time all three of the rows will spin. If you receive any winning combinations, you will be paid out according to the paytable. You have to bet on all of the three rows. The top jackpot on the Goblin’s Cave multispin slot is the Ruby symbol. Three of these is worth 150X your bet per row. The Ruby also acts as a wild symbol and can complete any winning combinations. The next best payouts are the Crown symbols. Payouts on the Goblins Cave multispin video slot are as follows (payouts in parenthesis): 3X Lamp symbols (bonus game), 3 Coin symbols (1), 1X Ruby symbols (2), 3X any Ring symbol (2), 2X Ruby symbols (5), 3X Green Ring symbols (5), 3X any Jug symbol (5), 3X Purple Ring symbols (10), 3X Red Ring symbols (15), 3X Green Jug symbols (20), 3X any Crown symbol (20), 3X Blue/Red Jug symbols (35), 3X Red Jug symbols (50), 3X Green Crown symbols (75), 3X Purple Crown symbols (100), 3X Red Crown (125), 3X Ruby symbols (150). There are 17 winning combinations on the Goblin’s Cave video slot. To play Goblin’s Cave and nearly 200 other exciting games, sign up and make your first deposit at Titan Casino to make use of their $4,000 signup bonus today! Are players located in the United States able to play Goblin’s Cave for real money? Unfortunately, Playtech online casinos are not accepting players from the US at this time. As far as US-friendly alternatives go, there aren’t a lot of multispin slot games around, but US players can play one called Megaspin over at Slotland Casino. 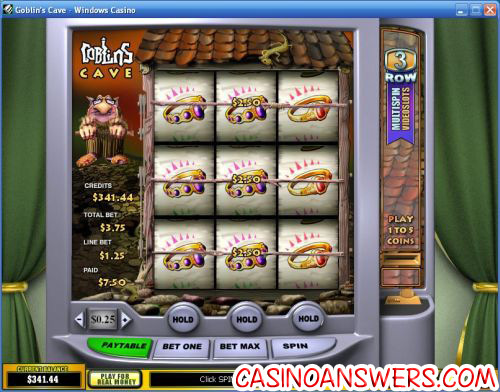 What is the best place to play the Goblin’s Cave online slot? There are many great casinos where you can play the Goblin’s Cave multispin video slot, but two of the best are Titan Casino and Bet365 Casino. You can read our Titan Casino Review and Bet365 Casino Review for more information. 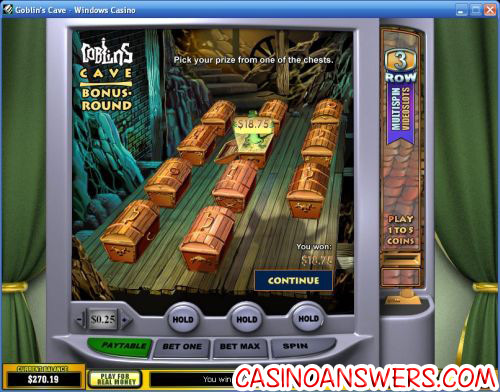 What casinos offer the Goblins Cave casino game?